Here comes a new Axxis album, not long after the unbelievable Paradise In Flames, still a favorite of mine. Doom Of Destiny bears the name of Axxis new opus, god I love the name of Axxis' album, they sound so epic, and well he best about them is that they are ! If you've listened to Axxis last two albums then you'll recognize their style instantly and you'll see that the band did not lose their panache and grandiose melodic factor that makes them the great band that they are. I've been a fan of Axxis since 1989, since Kingdom Of The Night, since the first time I've listened to Never Say Never, one of my all-time favorite song (period), with one of the most amazing brain smashing melodic guitar riff ! While Axxis doesn't play this song live (at least I didn't get the chance to listen to it) is beyond me :). But well, that's another story and I'm getting sidetracked here. It took a few listen to fully sink into the mood of this new album, I had some problem getting by the opener song (with an Arabian touch) at first, but now I simply love it, just as I love the full album in its entirety. First of all the album as less slow songs than in previous Axxis offerings, and that is a big plus for me, cause while I love ballads, I don't look for them as much as I would bombastic fast and epic tracks. I also love catchyness and this album is diamond in that regard. Not one boring song (a few very short female vocals non-sense moments here and there, but they're quickly forgotten). If you read my previous reviews from Axxis you know I'm not too keen the band has a Nightwish-like singer in their midst. Not that she sings bad (but she's no Tarja), its just that Bernie's vocals are so fraking awesome that anything she throws in there is bound to be of a lower level. But I understand the move, I know it might bring Axxis more fans and for that reason and as well as my love for this band, I resigned myself to accepting the songs with the additional vocals :). Actually after a few listens they dilute well into the mix, and they are not used too profusely which I'm also very glad about. Now to the album, its a pure joy ride of melodic and bombasticness like very few bands are able to deliver album after album, fast and majestically melodic songs with choruses you're not gonna forget anytime soon. I'm constantly singing their song in my head, without realizing it. The album is loaded with fast songs like : Doom Of Destiny, Blood Angel, Father Father, She's Got Nine Lives and the ultimate icing on the cake : Astoria (more on that song later). Some heavy mid-tempos and only one ballad, The Fire Still Burns, great and emotional, as always with Axxis. Guitars are great, even though Axxis changed a guitar player you won't really hear the difference. Nice solos even though usually short and melodic ones (as opposed to long and technical that aren't always such a good thing and well wouldn't work with Axxis music imho). The album is one of these rare jewels that are actually better as a sum of all parts (songs) than just picking your favorites, it flows perfectly with an over-the-top production and crystal clear sound. From beginning to end its pure pleasure. The right amount of heaviness, melody and majesty throughout. Some unusual instruments appear here and there, like on Revolutions (fortunately the chorus erases the little weirdness of the verse of that particular song). As always Bernie's vocals are simply : STELLAR ! He sounds just as good as he did back in 89, if not better ! Some songs like Father Father will remind you the majesty of Stratovarius with its strong keyboards parts used perfectly on a fast and melodic song. The duo also works very well in this song, much to my surprise. The more you listen to this album the more you get enticed by its majesty. Its a tad inferior than its predecessor but not by much actually (maybe because its a bit shorter). The cherry on top of the cake is Astoria, the album last song and also the best one, as its simply out of this world, epic to the bones, grandiosely melodic with a chorus to die for. Its to the level of both Never Say Never and Tales Of Glory Highland. What a way to finish an album : Astoria all the way ! Now a little anecdote, my wife loves Axxis too (she really can't stomach the female vocals though), one of the very few bands I listen to that she likes, which makes me feel that Axxis is also an accessible band even to non fan of metal (like Nightwish is as well). Funny thing, Axxis as become more than just a common ground for music listening in the car with my wife, its became a traveling game. Every time we put Axxis we are possessed by the need to whistle along the vocal melodies, not something so easy all the time, and it often ends in both my wife and I laughing hard when we can't hit the right note or we get out of breath to execute the whistling correctly... a very funny an healthy game that usually makes trips a lot faster, funnier and well, also helps when I feel sleepy. If you know Axxis, then you'll not be disappointed with this new opus, you'll get more of the same quality Power Metal you've been used to since Axxis comeback (thank the gods for that !). 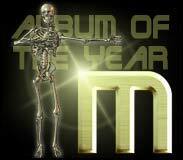 The band has been releasing albums like clockwork lately and its actually amazing how great the result is. To confirm that Axxis will be going on tour (they might be already) with no less than Gamma Ray and Helloween ! Which is great for the band, it will give them the attention they deserve, as I believe they are less known than many acts in their category, while they are, in my opinion, one of the best Power Metal band you can find today. If you don't know Axxis yet and like melodic, sometimes bombastic, always catchy songs with the ultimate singer, then you cannot ignore this band no more ! One of the best albums of 2007, and that was a no-brainer decision on my part. 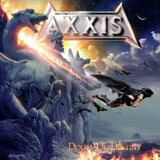 Long live Axxis, since you came Back to the Kingdom the flame of Metal music shines brighter and brighter ! A must buy for every Power Metal fan out there.